Top 10 Instagram Accounts. Promoting Women the Right Way. 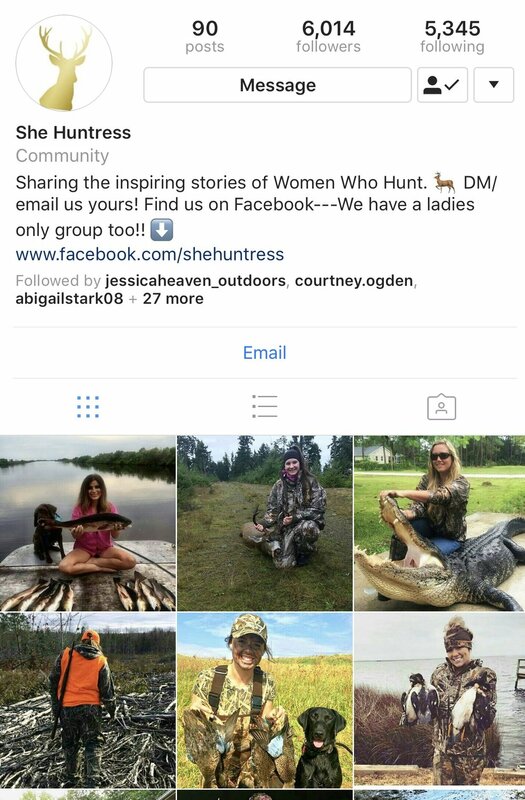 Within the past year Instagram has become flooded with accounts "promoting" women in the outdoors. From country girls to arctic anglers, women hunters to cowgirls, there is a page to promote every kind of women in the outdoors. Unfortunately not every account is doing it with what I like to call "role model" standards. However, I am happy to report that there is an entire online community for both hunting & fishing that is raising the bar & standards! These 10 accounts in my opinion are the best ones out there. They genuinely support, encourage and grow the number of women in the outdoors. Each account has a different mission, but rooted at the core of each company is the same sole purpose; to educate and encourage women to get involved in the outdoors, be it hunting or fishing. These accounts are positive, clean, and pride themselves on putting out content out that all generations of women can use. This is not to say that there are not other accounts out there, but for me, these are my top picks! If you are new to the outdoors, welcome! If you are a veteran, welcome! & if you are simply looking for an encouraging community to share ideas, ask questions, or simply connect with other like minded females, these account below will provide just that! Huntress View is a place where women hunters, whether they be experienced or beginners, can go to gain insight on hunting and shooting from a woman's point of view. I know women have a different outlook on things than men and hunting is no exception. After introducing some of my friends to hunting they told me they were glad that they learned about it from another woman rather than from a man. With this concept in mind I created Huntress View in October of 2013. At Huntress View we field test hunting products and give honest feedback, letting other women know what products are working for us. We share our hunting experiences, good and bad, give hunting/shooting tips, and share what we have learned along the way. By doing this we hope to encourage more women to get involved in hunting, shooting, and the outdoors. Sportswomen United was created with encouragement in mind. Although we have seen a rise in the number of women in the outdoor industry, I fear beginners may get discouraged early on. it is still very common to see women put one another down online with the rise in social media platforms such as Instagram and Facebook. I know everyone has been guilty of judging others at least once, but I hope that Sportswomen United can help women come together and support each other. We will provide reviews and honest feedback on products we have used before, letting others know what has or has not worked for us. We will share our hunting, fishing, or outdoor stories and experiences, whether they are good or bad. With these reviews and stories posted to our blog, we hope this will provide tips and support that will ultimately encourage more women to get involved in the outdoors. The Women’s Outdoor News, aka The WON, features news, reviews and stories about women who are shooting, hunting, fishing and actively engaging in outdoor adventure. With a band of columnists and reviewers, photographers and female correspondents, The WON engages its readers through a blog format and we invite you to talk to us. Network with us. Let us know what you’re doing outside and what you’d like to learn about. ADVENTURESS is a free digital magazine tailored for the outdoor woman and country lifestyle. With articles written by and photos showcasing fellow outdoor women, it is intending to inspire women to try new things and inform them for greater skills in anything outdoors, including hunting, fishing, gathering, gardening and do-it-yourself projects ~ HUNT. FISH. EXPLORE. LIVE. Currently, ADVENTURESS is a quarterly magazine, releasing an issue each spring, summer, fall and winter. The magazine can be viewed from any digital device (computer, laptop, smartphone, tablet) as well as downloaded as a PDF for personal storage and offline viewing. Past articles can be found in blog format and searchable on the website. It’s news to no one that society imposes values and expectations on women that are rarely more than skin deep. All too often, we are judged by our outer, superficial selves, and our real beauty – that which lies within us – goes unnoticed. Even though we intuitively know our real value and the beauty of our inner spirit, the weight of it all can sometimes make even the strongest of us weary. And that’s where Able Women comes in. Welcome to the official She On The Fly website. Our company was born in the winter months of 2016. The brand started as an idea with the intention of sharing, creating, and collaborating with other female anglers from around the globe. By 2017 we experienced some amazing growth and changes. Our mission will always be to uplift women, inspire them to learn more about the sport, from novice to expert. Over time our image and intention has taken an organic shift that has brought us many opportunities to get our message out there. SOTF now has the opportunity to sponsor charity events with merchandise, collaborate, create and promote with some incredible companies in the industry. Older PostWatershed Dry Bags. What's in the Yukon?